German Sauerbraten | Let's Cook With Bry! Sauerbraten brings back many memories for me, from the wonderful aromas emanating from the kitchen of my Czech Oma, a New Year’s spent with relatives in the Black Forest region of Germany, to the dinners made for my extended family by my German Aunt Isolde. The spicy-sweet gingersnaps soften the tang of the vinegar and are a mandatory ingredient for its authenticity. Because the roast is tenderized by marinating in the vinegar, a less expensive cut of meat can be used. Place first 10 ingredients in a large heavy-duty zip-top plastic bag; seal the bag. Turn bag to blend marinade. Place the roast and onion in bag and reseal, turning to coat. Marinate in the refrigerator at least 24 hours or as long as three days, turning bag occasionally to redistribute the marinade. Remove roast from the bag, reserving marinade. 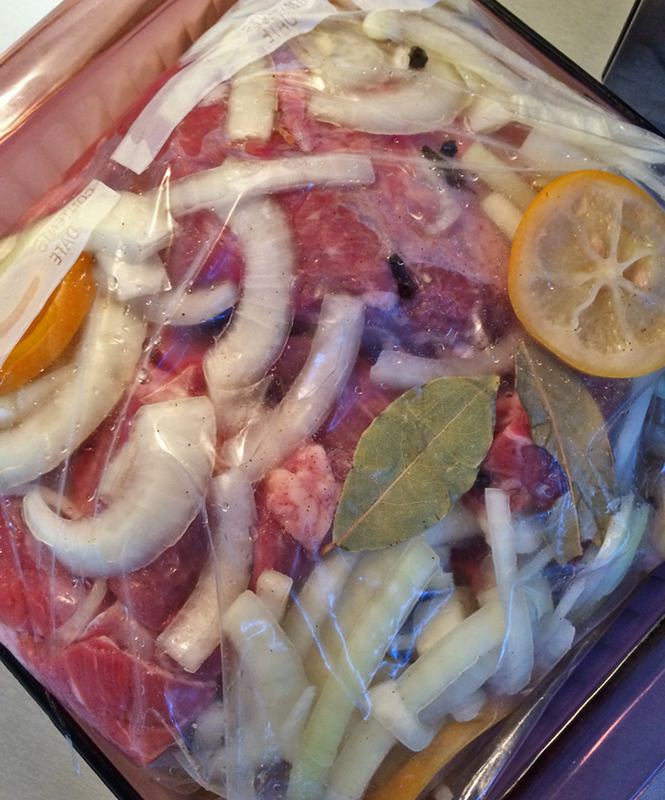 Place roast in a 5-quart electric slow cooker or dutch oven. Strain reserved marinade through a sieve into a bowl, reserving 1 1/2 cups; discard remaining liquid and solids. Pour 1 1/2 cups strained marinade over roast. Cover and cook on low for 5 hours or until roast is tender. Remove roast from slow cooker; cover and keep warm. Add gingersnap crumbs to liquid in slow cooker. Cover and cook on high for 10 minutes or until sauce thickens; stir with a whisk until smooth. Serve the sauce with the roast, garnished with parsley, if desired. 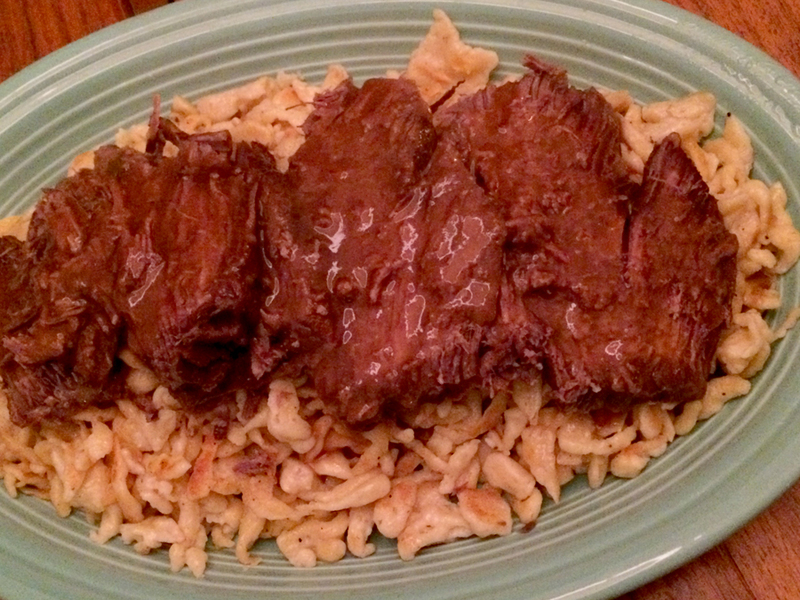 Serve the beef and sauce over spaetzle (tiny egg noodles or dumplings) with a side of cider-braised red cabbage for an authentic German feast. Pingback: Cider-Braised Red Cabbage | Let's Eat With Bry!